This study examines the factors influencing students’ under-performance in an advanced financial reporting course. Specifically, this study examines four factors which may influence the accounting students’ under-performance in an advanced financial reporting course, namely class attendance, curricular activities, internship experience and English language proficiency. This study conducted a questionnaire survey on 83 final year accounting students who had failed the advanced financial reporting course at least once. The results indicated that class attendance, curricular activities and internship experience are associated with students’ under-performance in this course. However, English language proficiency is not a significant factor influencing students’ under-performance in the advanced financial reporting course. This indicates that understanding the content rather than the language used to teach the course is more important for student success in this field. However, further analysis shows that English language and curricular activities are significant factors for success in the advanced financial reporting course when regressed with other factors. These findings could assist academics in understanding the factors influencing students’ under-performance in the advanced financial reporting course and subsequently help develop strategies to improve results in the classroom. This study contributes to existing literature on the importance of class attendance, curricular activities, internship experience and English language proficiency on accounting students’ performance in the advanced financial reporting course. 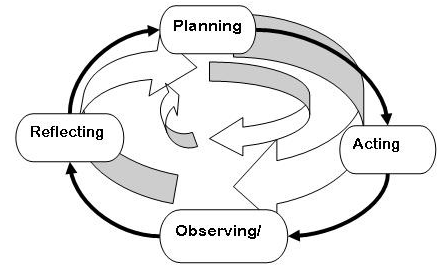 In teacher education, action research has served as one of the tools for reflective practice to bridge the gap between the educational theories learned in the teacher training college and the actual pedagogical practice within the four walls of the classroom. In this descriptive and explorative research study, first the concept and characteristics of action research are outlined, supported by a discussion on action research types and models that are relevant to teacher training in Malaysia. Then, this paper explored the implementation of action research component in teacher education in Malaysia by first providing brief background information of action research in Malaysian teacher training institutes. Then, it discussed issues and challenges that are faced in terms of curriculum, teaching methods and objectives. The study also discussed the rationale for integrating action research component in teacher education programme. The result shows that the implementation of action research is hampered by the absence of exposure to action research in the earlier part of the training, the curriculum lacks practical input and the objectives set can be general and vague. It is recommended that action research workshops and trainings are conducted earlier in the training program and that more hands-on learning experience is introduced. This article contributes to the existing literature by providing an overview of action research implementation in teacher education system in Malaysia. It discusses the issues and challenges that are faced by action research supervisors and trainee teachers. It also highlights the rationale for integrating action research component in teacher education curriculum. This study aims to examine employers’ expectations of knowledge and skills in accounting graduates before hiring them. Using a qualitative approach on accounting practitioners and academics, this study shows that the expectations employers place on accounting students in the Industry 4.0 environment is set to change significantly, particularly in technologies used in the preparation, reporting and dissemination of financial information. Specifically, this study showcases the strong views expressed by a panel of experts comprising accounting practitioners, particularly on the subjects of job redundancies and the degree of replacement of human activities by electronic devices and machines. The replacement of physical human activities by machines is therefore expected. In addition, accounting practitioners see the need for accounting graduates to focus on continuous learning and education, particularly in acquiring knowledge and skills in IT. Hence, there is a need for academics and universities to incorporate various accounting technologies and simulations that are applicable to the Industry 4.0 environment, in their teaching and learning activities. This study contributes to existing education literature by providing new findings on the expectations of employers of future accounting graduates. In addition, this study contributes to the further understanding of academics and universities in strategizing ways and innovating new teaching and learning approaches so that accounting graduates’ employability can be enhanced and the needs of the current market for accountants can be accommodated. This study is the first to provide findings on the expectations of employers of future accounting graduates in the era of Industry 4.0 in a Malaysian context. Foreign language teaching and learning is one of the topics in the field of K-12 education and adult learning. Most of the current research studies tend to focus on the development and training of foreign language learners. However, issues such as teaching strategies, methodologies, classroom management, and personal beliefs of teaching and learning are neglected. As teachers are primary tools to deliver lessons at all different levels, educators and researchers are increasingly concerned about how teachers’ beliefs and personal background may influence classroom management, curriculum and instruction planning and expectations of students. 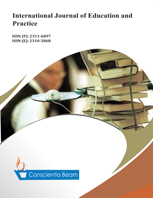 The current study is a literature review of the concept of teachers’ beliefs, followed by a review of studies exploring teachers’ beliefs using different methodologies. The relationship between teachers’ beliefs and teachers’ classroom practices is also discussed, along with factors influencing teachers’ beliefs in teaching professional development courses. This study contributes to the existing literature on teachers’ personal beliefs and teaching behaviors. The paper's primary contribution is also to study how teachers’ personal beliefs influence their classroom management, teaching styles, and instructional feature. Sulastriningsih Djumingin , Sukardi Weda , Juanda . Anxiety in the classroom presentation has a debilitating effect on students’ success in learning a foreign language (FL) or a second language (L2). This article aimed at investigating students’ Anxiety in classroom presentation in Teaching – Learning Interaction of English as a Foreign Language for Students of Indonesian Study Program in general at higher education levels in Indonesia. The participants of this study were the students of Indonesian Education and Literature Department, Faculty of Education and Literature, Universitas Negeri Makassar (N = 62). There were 55 or 88.71% females and 7 or 11.29% males from the seventh (42 or 67.75%) and ninth (20 or 32.25%) semesters. The findings reveal that the most frequent source of students’ anxiety was attending disorganized classroom presentation. The implication of the study is that anxiety is an interesting phenomenon in language study which potentially contributes to students’ failure. Therefore, teachers at a school need to manage the class well, while the lecturers at the university need to give a lot of time for students to learn the topics for discussion. This study contributes to the existing literature on Anxiety in classroom presentation in teaching - learning interaction in English as a Foreign Language in Indonesia. As one of contributing factors to classroom low achievement, Anxiety syndrome needs to be understood by teachers and learners at the university.